Do you know why a spider spins web endlessly or why does a sunflower always face the sun? Why does Moon change shape every night or why do you hear Echo in hills? Well, in this age of Science and Technology, I believe none of these questions seem unanswerable or exciting. The scientists and biologists have made these natural phenomena look even simpler by expounding theories for their real cause, and even to untrained, mundane eyes, the wonders of nature evoke least interest. However, thousands of years ago, when our ancestors had little knowledge, how could they have understood the marvels of nature. Were they not bemused by falling stars, rising sun and diminishing moon. They must have tried to explore nature in their own way, and created thousands of stories to decipher the wonders of nature, and luckily some of these stories survived as a part of mythology and tradition, passed onto the successive generations, by creative poets and worthy geniuses. 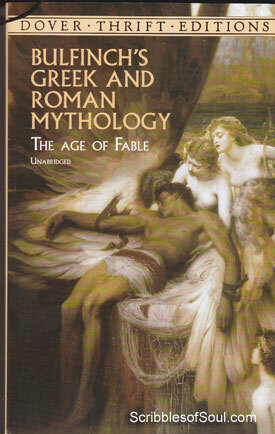 Bulfinch’s Greek and Roman Mythology:Age of Fables, is one such masterpiece. Simply speaking, it is a haphazard collection of mythical tales and adventure of Greek and Roman origin, and may even come across as crudely fantastical work of a busybody, to some readers. However, if you do feel stuck by the beauties of nature, and would love to have an interesting, though not necessarily logical interpretation, The Age of Fables, is a good beginning. I have just finished reading it and I am joyous with entertaining stories and bizarre explanations. While reading, I was transported into another world, a cosmos of creative fantasy and overactive imagination, with hundreds of stories spun to decipher the wonders of nature. Be it Chyris, Hycanthese or Narcissus, each story had its own magical charm. And as I continued reading, I had a sense of Deja Vu, when poetry of Pope, Milton and Spenser were referred to. How ignorant had I been of the similes and metaphors used by these stalwarts. Though, I did enjoy their poems, when I read them during my PG, most of them went over my head, because of lack of understanding of mythology. It was only now with Bulfinch’s lucid explanation, that I could understand the real import. And, believe me , Narcissus and Comus just reinvented themselves in the light of newly divulged fictional facts. Moreover, Homer’s Iliad, Virgil’s Aeneid and Sophocles Oedipus, heavy weight classics, I had always chose to ignore, were presented in a very easy manner by Bulfinch. The scenic wars of Troy, mesmerizing fights with monsters and thrilling adventures of Ulysses and Aeneas cast a magical spell on me. I was so impressed with the interpretation of Iliad, that I ended up re-viewing ‘Troy’ the movie, so that my visual senses be satiated with the heavenly nectar, my brain had already tasted. So, needless to say, I found Bulfinch’s The Age of Fable, interesting, impressive and equally useful for not just entertainment, but also for easy interpretation of Classic poetry, and that too after a century has passed, since the first edition of the book was released. It does speak volumes of the utility and prowess of the book. Though, I must say that I found the narrative style a bit laid back and boring, till Troy happened. Had it been presented in the same lucid manner in the initial pages as well, it would have definitely ranked much higher on my ‘To be read again’ list. All in all, a worthy book for anyone and everyone.